I use this bleeder valve with a pressure guage to check the pressureof my beer when its carbonating in the keg. Connect it to the gas in side of the cornie. I let off excess pressure every so often until it stabilizes close to serving PSI. Good for over carbonated beer. 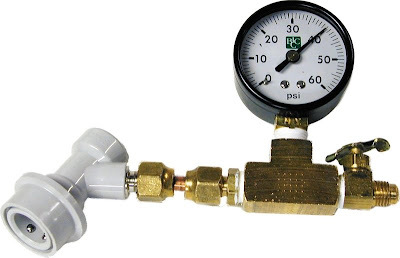 If you prime your kegs to carbonate them you can use this to help monitor that fermentation. No more increase in pressure, means it must be close to finished. Of course that's just me. Maybe I like things with guages. Note: Photo from Norther Brewer website. If you have a double gauge setup on your tank and a bleeder valve on the top of your corny (likely on most cornys). what is the purpose of having one of these? Looks like a lot of connections and hassle. I now see that you are priming and fermenting in the keg. I guess it could be useful in that setting but I usually finish fermentation before I keg my beer. I wouldn't call it one of those must have pieces of equipment. I bought on a whim and now I use it to find out how much pressure is in my kegs while naturally carbonating.